One of the most used appliances in your kitchen is your garbage disposal. 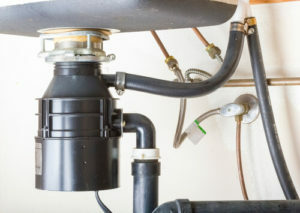 Keeping it running smoothly and avoiding repairs are top priorities for many of us, but if your garbage disposal is not working as it has in the past, it may be time for a new one. Steele Plumbing can help you as we provide professional garbage disposal repair and installation services. Whether you want a basic model or a deluxe disposal, you can trust our experienced and licensed plumbers to install it properly. We can also help you find the best garbage disposal for your needs. We would like to share with you some tips on how to keep your garbage disposal working at its best. Watch what you put into your garbage disposal. While your garbage disposal can handle most food scraps, there are certain things you should never put into this appliance. Peelings from potatoes and bananas will form a starchy paste when cut up and clog the drain. According to The Spruce, putting eggshells and coffee grounds into your disposal also can lead to clogging the drain. Use ice cubes to clean your garbage disposal. The best way to maintain your garbage disposal is to routinely grind up ice cubes in it. Not only does this clean your disposal, but it also sharpens its blades. While you may have heard that lemons can be used to clean your disposal, Steele Plumbing advises against this. Instead, combine a half cup of vinegar with a couple of handfuls of baking soda and pour it down into the disposal. Let that sit with the unit turned off until the foaming stops and then rinse the drain with hot running water. Never use bleach as it is very caustic and can harden your drain lines. Bleach will also make your septic system less effective by killing the bacteria that is necessary for it to function. Keep your disposal running clog-free. The best way to keep your disposal from becoming clogged is to always flush it with running water as it is grinding up food. Continue to run water for at least 30 seconds afterward to ensure the food has exited the disposal. You can also use degreasing dishwashing liquid to deodorize your disposal. It is simple to maintain your garbage disposal, but if yours needs to be repaired or updated, Steele Plumbing can help. Contact us today to make an appointment with our licensed plumbers.